Cauliflower | K. Zafeiropoulos - A. Tomaras Industrial and Commercial S.A. Served as an appetizer or accompaniment. K. Zafeiropoulos - A. Tomaras Industrial and Commercial S.A. sells finely chopped cauliflower, preserved in brine. Cauliflower has a high nutritional value and it can protect us against various heart diseases and cancer. It is ideal for those who want to lose weight as it does not contain fat and it has low calories. Its low carbohydrate content makes it a good substitute for potatoes. It is also rich in vitamin C, a powerful antioxidant that helps build a strong immune system, prevents the aging of the skin and accelerates wound healing. 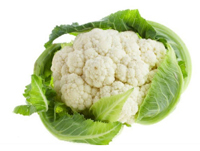 In addition, the cauliflower contributes to the detoxification of the liver and blood and to the treatment of various diseases, such as disorders of the kidneys and bladder, high blood pressure, arthritis, constipation and asthma. The multiple benefits of cauliflower for our health make it a vegetable that should be part of our daily diet, if we want to be healthy and reduce the risk of various diseases, such as heart disease and cancer.